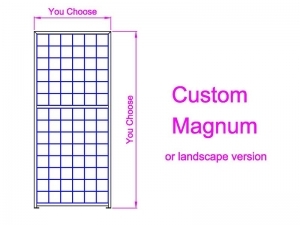 8 bottles high x 12 wide - Magnum was successfully added to your wish list. "Primat" wine racks are manufactured using powder coated steel tube and wire. They are designed to simply and easily stack on top of each other to expand the storage capacity. Primat wine racks are suitable for assembly under stairs - making great use of a difficult area. Primat wine racks can be combined to fit the underside of any stairway. One distinctive advantage of this system is that wine bottles are held in position - and cannot roll. This Rack is 60cm high x 66cm wide. 40cm depth should be allowed for most bottle sizes. Primat Wine Racks are manufactured from mild steel tube and wire. They are powder coated satin black. Primat Wine Racks are supplied with all connecting hardware and wall/floor connecting hardware and with complete assembly instructions. Note - these racks are deeper than the other Primat Racks - so they will only "stack" with a special hardware order. Pricing is dependent on the size and weight of your order and your location. Our "Shopping Cart" system will include delivery in your checkout price (for most locations). If it can't, we will receive your information and email you a quotation for your consideration.